Choosing something to do for your little one’s birthday can be tricky. Many parents still opt for some kind of activity outside of their own home as it means they can enjoy the party with their birthday boy or girl, stress free. Since the recession however, families have been feeling the pinch more than ever, and finding ways to do things for less has become a top priority. This has led to more and more children having traditional birthday parties again. No bad thing, as jelly and ice-cream, pass the parcel and musical statues are party classics for a reason. Don’t dismiss a good old-fashioned party with some of your child’s friends; find a way to make it special instead. One way to give your son or daughter an extra special birthday party is to give it a theme. You don’t need to spend a fortune as most props can be made at home, and you can adapt normal birthday favourites to fit. Shape sandwiches into characters, print pictures to decorate the house and go crazy with costumes. You don’t need to buy expensive fancy dress or stay up all night making it either, as you can get great value girls and boys fancy dress from George at ASDA. Here are some ideas for party themes to get you started. Whether they prefer Marvel or DC, most boys will have a favourite superhero. There has been a big influx of superhero films in recent years and it’s hard to escape the merchandising associated with this. You could make sarnies in the shape of Superman’s badge, do your living room up like the bat cave with dark sheets, or even have a red and blue theme for Spiderman fans. You can get some great superhero outfits at George at Asda for ages 1 to 8. Fairies are one of the most prolific of all the mythical creatures. There is the tooth fairy, the fairies at the bottom of the garden, the sugarplum fairy, the fairy godmother, and many, many more. Kids love the idea of these little imps that spread magic and happiness wherever they go. Give them a pair of wings, either homemade or bought, and paired with any outfit they are immediately a fairy. Deck the house out with some printed paper leaves and branches to make a woodland hollow, and you have the setting for your very own fairy party. If you are looking for a theme that suits boys and girls equally, then a safari or jungle party can work really well. This theme also gives you a lot of scope for decoration and costume ideas, as it is so broad. If you know anyone who is great at face painting, this is a great time to call in a favour. Have them paint all the partygoers faces as their favourite animal as an extra treat. Use your imagination and put different animals in different rooms to make a real life home safari for the little guests. A birthday party at home is just as good as an activity party. Get creative with the theme and your child will remember their birthday much longer than the same old soft play or bowling party. So get planning! My little darling princess would love that idea, she loves Helly Kitty! Those are great party theme ideas. For my Pakoy, yung Super Heroes is great. 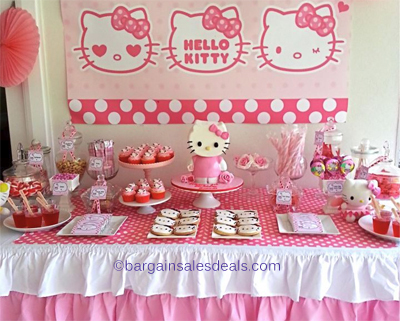 I think my daughter will prefer a fairy themed party :) I love that Hello Kitty arrangement! i loved themed parties! i'm thinking of a superheroes party for my son.